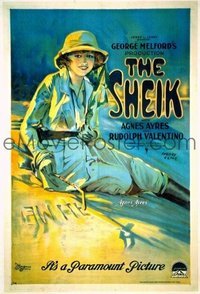 The Sheik, the classic 1921 George Melford Arabia silent romantic melodrama ("It's a Paramount Picture"; "Based on the novel by Edith M. Hull"; about an Arab sheik who meets a female British socialite, and he falls heavily for her, but she wants no part of him, so he kidnaps her and takes her to his palace in the desert; she rejects him, but after she is re-kidnapped by bandits does she start to realize that she has fallen in love with the sheik, who rescues her in the nick of time!) starring Rudolph Valentino (in the title role as Sheik Ahmed Ben Hassan), Agnes Ayres, Patsy Ruth Miller, George Waggner, and Adolphe Menjou. Note that Valentino had risen to stardom in the late 1910s, but this movie made him a superstar! He would complete ten more movies over the next five years, but sadly, after making a sequel to this movie, "The Son of the Sheik", in 1926, he passed away from complications after surgery. He was just 31 years of age, and the entire world mourned his passing.